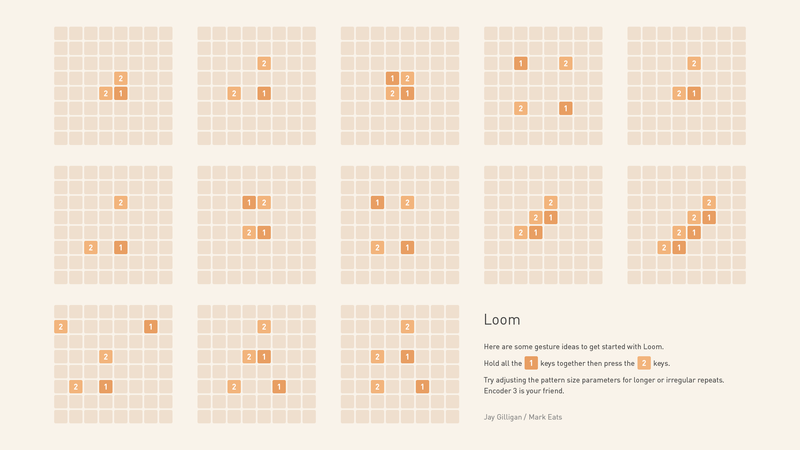 Pattern weaving sequencer for grids. Slightly generative, surprisingly controllable, works with Molly the Poly or speaks MIDI. Triggers move horizontally. Notes move vertically. Pitches are mapped across the note columns. When triggers and notes collide they sound. Hold a grid key and press another on the same row or column to add a trigger or note. Three keys at once clears a row or column. E3 can be used to add random triggers and notes (no grid required) or remove the most recent additions to a pattern. It’s a quick way to make variations of an existing pattern. Don’t forget to check the parameters list for synth options – patch creation lives right at the end. i like the added pop up graphics when turning encoder 3! also…the quick random synth patch generation is REALLY useful!